There were notes on stage asking people not to sit on the floor “because we need every inch we can get.” Luminaire, you’re so sweet and honest. 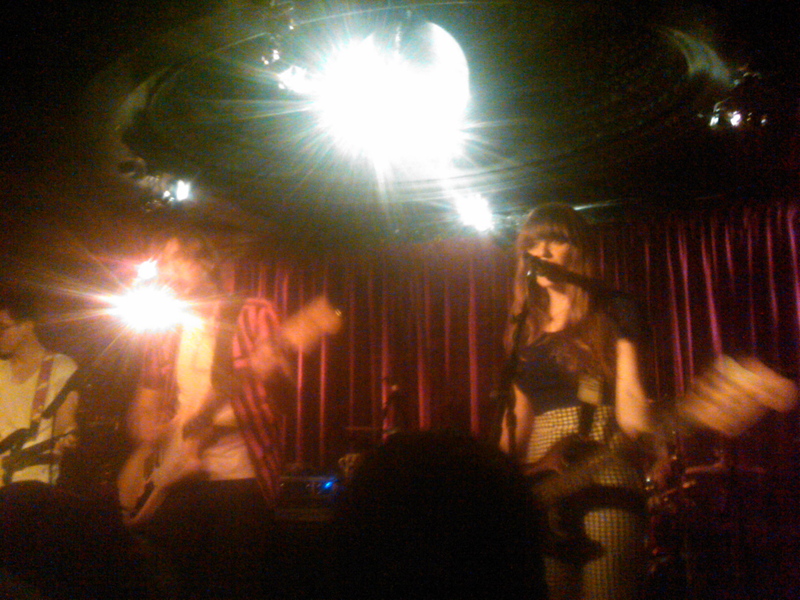 La Sera is full of bouncy bass and hairbows. Katy Goodman and her friends brought us sweet, swirling indie rock from Los Angeles. 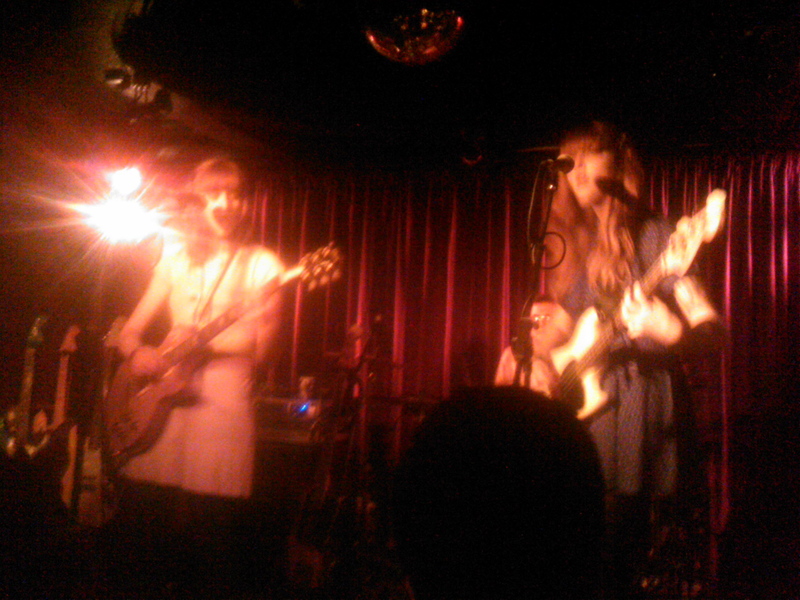 Goodman, the lead vocalist and bassist, looked like she’d just walked off the set of The Virgin Suicides in a baby doll dress, tights and her long, red tresses. She was accompanied by Jen on vocals and guitar, and a drummer named Matza, except the spelling of his name is probably wrong, but he can cry or yell at me if he’d like since I can’t locate him on the interweb. Matza looked like Napoleon Dynamite’s brother minus the social awkwardness, a lot, plus some great drumming capabilities. Standing in the midst of an English audience, I thought about how there’s something alluring about Americans when you’re not in America. There’s something mysterious and colorful about them. A couple of months ago, I didn’t believe anything about Americans was foreign or interesting, but today I’d say different. La Sera is upbeat and calming at once. It’d be great in your living room mixed in with the carpet and a conversation across the coffee table– or while driving in the heat with your arm riding the air that’s going in the opposite direction of the car. Twin Shadow’s “Slow” began to envelop the space in between sets. If this is any indicator, their music feels as good as they look. Jenny Lewis couldn’t stop smiling, which in turn made Johnathon Rice smile. Their set was a shot of life through yours ears, eyes and skin… waking us all up. I hadn’t noticed the country in her voice until tonight. “This song’s a love song,” said Jenny raspily, sarcastically and sexily while looking at Johnny. “From one English boy to another,” added Johnny. Goodness, they’re both so charismatic. Johnny is a whisper and Jenny is a howl. After asking the audience what they wanted to hear, a girl called out “Sweet Home Alabama.” [!] J+J’s faces dropped and stared blankly in her direction. Johnny leaned towards the microphone and drawled, “Not on your life, sweetheart,” which produced a big, collective laugh. One encore later we were left riled and revved up, and Jenny+Johnny sent us off into the night to conquer ourselves.